It’s Group Night again on American Idol and we’re in for crying, fainting, pleading, shattered dreams and belching. After zero singing last week, I’m looking forward to seeing some (good) singing and some of my favorites that haven’t been nearly enough screen time, like Colton Dixon. Groove Sauce is comprised of early favorites Reed Grimm, Creighton Fraker, Nick Boddington, Aaron Marcellus and Jen Hirsch and they kill it on “Hold On I’m Coming” with harmonies, memorable solos, capable backing vocals and even some clean choreography. I have a feeling all five are making it through and after accolades and standing ovations, that’s exactly what happens. 6-7-9 consists of Brielle Von Hugel who was in a group with celebrity favorite Pia Toscano last year, made it to the Vegas round and has beaten this group into submission hoping for the same results. My favorite girl Shannon Magrane slayed the ending of their song and is pushed through along with Brielle. Now we get a string of crappy contestants who forget lyrics and mumble and bumble their way through songs. Next up is Four Girls And That Guy and they had one sick member and the other four were a pitchy mess. No one makes it through. A young super group who call themselves Hollywood Five consists of Eben Franckewitz, Gabi Carruba, David Leathers, and Jeremy Rosado are one of the best of the day with their run through of Duffy’s “Mercy” and it pays off because the whole group makes it through. Area 451 is a foursome who may have to go on as a trio if their member Imani Handy can’t stop passing out. Johnny Keyser is in the group and is the one bright spot on “Broken Strings” before Imani comes out and looking fatigued, she still sounds good until the very end when her eyes started to shut, her mic got wobbly in her hand and she ultimately passed out. She’s OK and Johnny is the only one to make it through. We see montages of other groups who lose some fan favorites and even though we don’t get to see his group, I see Colton Dixon walking off the stage and didn’t get mentioned as leaving so I know he made it. M.I.T consists of Heejun Han, Phillip Phillips, Jairon Jackson and the annoying cowboy who caused so many problems last we saw them. The boys chose “Broken Wings” as their song and as much as I love Heejun and Phillip they were rough but I know the judges love them. After it’s all over I’m certain the cowboy is out but, I’m wrong and the whole group makes it through. Now the 43 groups are reduced to 98 individuals who are singing solo with the Idol band and an instrument if they so desire. After they’re done with their song they are given no judge feedback and must wait until everyone’s done to learn their fate. Joshua Ledet is first and before he even starts Steven yells, “Heal me!” and JLo says “Oh he’s about to.” He silences the room with his version of “Jar Of Hearts” that has JLo making that “so nasty it’s good” face. My-pick-to-win-it-all Colton Dixon sings “What About Now” with his the piano and I think this is the same song he sang for Hollywood Week last year, he starts to tear up and the judges all applaud. Phillip Phillips growls and groans all over the place on “Wicked Game” and as cool as it sounds, his guitar playing was even better. Jen Hirsch keeps the streak of hot solos alive with a slow and sultry “Georgia On My Mind” that has all three judges out of their seat when she’s done. The judges absolutely love and adore Creighton Fraker whose voice drives me insane, I though he ruined “What A Wonderful World” while the judges all leapt to their feet. Pretty little soulful thing Shannon Magrane “hits a homerun” as Ryan Seacrest says in reference to her World Series winning father. 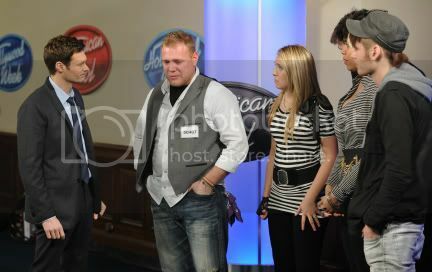 Reed Grimm has planned to sing a cappella but was told last minute that this phase of the competition has all contestants singing with the band. So with 30 minutes to go he had to go rehearse a new song and get a new game plan. It seems it’s gone well and then suddenly he tells the producers he needs to call his mom. He said the whole thing didn’t feel right to him. The he says he had a great idea and is inexplicably playing the drums and sings a sweet version of “Georgia On My Mind.” His masterful playing on the drums so last minute shows his musicality and Randy likens him to last season’s Casey Abrams. Reed leaves the stage excited and invigorated. As the judges deliberate the contestants are split into four rooms and the entire room is either a yes or a no. The judges arrive at Room One and after faking them out they are a “yes” and Jermaine Jones, Johnny Keyser, Joshua Ledet, Adam Brock and David Leathers are moving on. Rachelle Lamb is in Room Three and it’s the end of the road for her and the judges had a hard time because as Randy says, it’s the most talent packed group (all four rooms) of all his seasons. Shannon Magrane, Reed Grimm and Phillip Phillips and the rest of Room Two made it through. Room Four just heard two other rooms make it and can’t figure out what that means for them but seeing as it houses Heejun Han and Baylie Brown I was pretty sure it was a yes room and I was right. Tomorrow takes us to Las Vegas for the Elvis Experience and even more cuts. Check back here as I review, recap and heckle.